The Ice Age 50 in the Whitewater area of WI is one of the best known trail races in the Midwest, and even the nation. It’s a scenic run starting on the horse trails for 9 miles and then continuing on the ice age trail until the finish. The conditions of the trail were, in my opinion, perfect. It had rained the past few days, so they were soft yet not too slippery. I also went with a different shoe (Altras, Olympus…the older version and I’ll mention why later on!) knowing it would be wet out there. Unfortunately majority of the run was hot and humid. Saturday’s race was not a trail race, or run; nor was it a battle between other runners and myself….it was a war between my legs, within my head, and a full blown act of attrition…patiently waiting for others to make mistakes. That’s not easy for me! And so it began. Starting to my left was Zach Bitter, and a slew of other incredible racers, but no females in sight. Excellent. I stayed distracted talking to Sid Wegener, a running mate of mine. We started. I knew I was going to take it easy to start…until the 50k mark, as instructed by my coach, Tommy Rivers (still the most brilliant man alive!). He had to keep reminding me not to race this…so the distraction helped, because as the gun went off, so did four other females. I knew if I kept pace with running legend Dave DeHart I would be safe. And so that’s what I did…kept letting others pass us. We hit the 9 mile mark….legs were still not feeling like doing a 50 miler today, and of course had to go to the bathroom…for the record, this was not a good GI track day….yikes. Still running with DeHart…we kept plugging along…all conversation mode. I was in fifth. By mile 10 we chomped the fourth female…and mile 18ish the third (this was the masters winner, Shelley Cook). I was in third now. Dave and I were now running with Ryan Norton, a phenomenal runner who was using IA50 as a training run for the Kettle 100. We hit the turn around at mile 21ish…had my bottle switched out and grabbed some food. Thanked everyone for volunteering of course. Keep a smile when you run, you always do better! The three of us kept going….by mile 24 we hit the aid station and I had to use the restroom again. Such a bummer. The two guys kept going, and I caught up again. We passed the second place female…I was now in second. Time to hold position…I don’t like to chase runners, but rather hunt. And I knew first was quite a bit ahead. Now it was time to run smart. By mile 31 I was on my own….of course because of a duck out to the woods for a bathroom break. At this point I was suffering….my whole left leg was not 100% and I felt ill…it did help to go in the woods though!!! I was able to get my paws on ibuprofen at 34ish which helped greatly!!!! But my head kept finding excuses to quit. Why does this happen?!?! I hate mind games, yet I always manage to play them with myself during a foot race! I battled to 40 … It was single digits. Time to rock this out. I was in position for 2nd, I’m ok with that. And my main goal was to get an honorable time to register for NF50 California in December. I saw Sid on my way back and gave him a ‘you got this hug’ and kicked it into high gear…it was probably slow gear but felt fast 😝 it was a fast 10 miles and I showed gratitude the whole way back! Coming up to the start/finish, you could hear the crowd. The last 3/4 mile was a sprint…I saw my parents, Dave, Ryan, and many others waiting there. I was overwhelmed and could not have been more proud. Although my goal was 8 hours, I hit 2nd in 8:27. 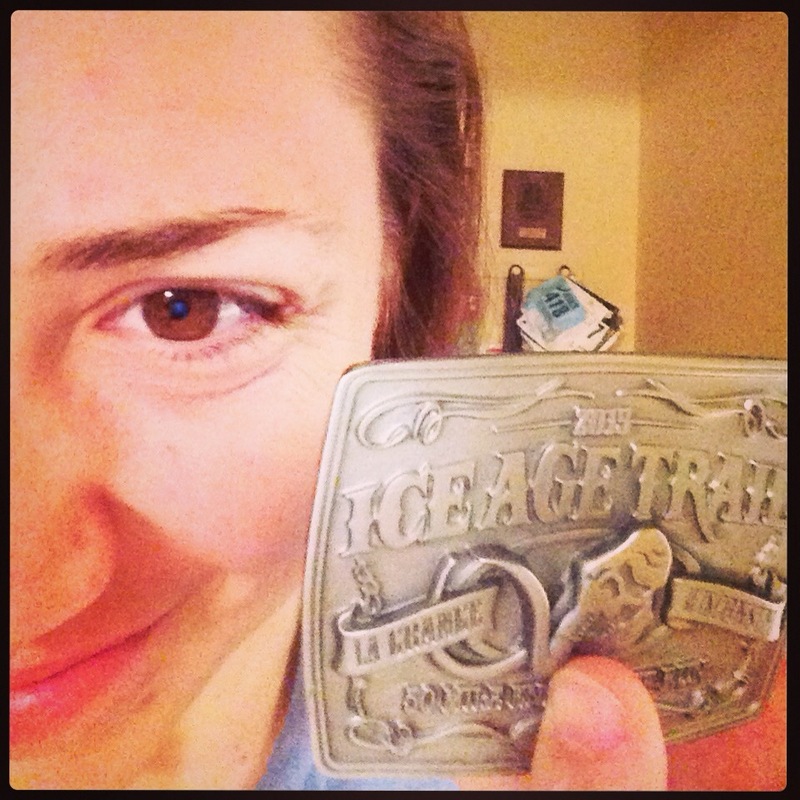 This was my third 50 miler (Dances with Dirt in 2011 in 10:15 and tBunk in 2014 in 9:15). I can honestly say the trails of AZ still seem easier than the IA Trail!! I’ll stand by that 😛 It was a successful day of battling, and I look forward to a couple training ultras in June and July (get through the heat!!) before more serious racing starts again. Shoes: ALTRA Olympus … I went with the older version because the toe is not as big as the 1.5. Knowing this is a moderately technical course and I’m prone to falling, I went with the shoe I knew I could avoid any tripping. Previous Article Pre-Race Jitters, oh no!